The concept of home improvement, home renovation, or remodelling is the process of renovating or making additions to one's home. Home improvement can be projects that upgrade an existing home interior (such as electrical and plumbing), exterior (masonry, concrete, siding, roofing), or other improvements to the property (i.e. 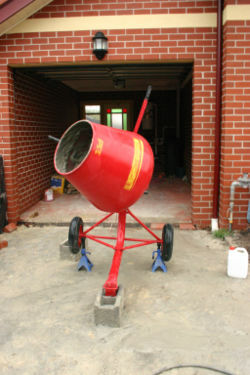 garden work or garage maintenance/additions). 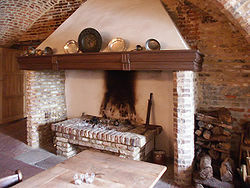 A fireplace is an architectural element consisting of a space designed to contain a fire, generally for heating but sometimes also for cooking. The space where the fire is contained is called a firebox or firepit; a chimney or other flue allows gas and particulate exhaust to escape the building. While most fireplaces are constructed in building interiors, sometimes outdoor fireplaces are created for evening warmth, outdoor cooking or decorative purposes. In colder climates throughout the world, the fireplace or hearth has traditionally been a central feature of the household, as it gives warmth to aid survival through an extended winter. The sensation of direct heat, and the mesmerizing leaps and flickers of a wood fire, make its use enjoyable in cold conditions even today. Fireplace mantels are the focus of custom interior decoration. A mantel traditionally offers a unique opportunity for the architect/designer to create a personal statement unique to the room they are creating. The Lou Henry and Herbert Hoover House, located on the campus of Stanford University in Palo Alto, California, United States, is a large, rambling house, resembling "blocks piled up." It was designed by Lou Henry Hoover, wife of Herbert Hoover, 31st President of the United States. After several consultations the Hoovers convinced Arthur B. Clark, a Stanford art professor who practiced freelance architecture during the summer, to be their architect. Clark agreed on the condition that Mrs. Hoover design the house and that Clark would serve in an advisory capacity. The problem of size was solved by the hillside site with the house disappearing into the slope of San Juan Hill and hence appearing much smaller. The irregularly shaped house was built on a reinforced concrete slab foundation and rises two stories in the front and three stories in the rear. 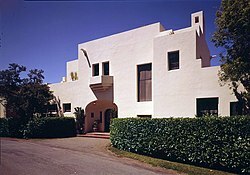 Resembling early International style homes, Mrs. Hoover's designs were modeled after North African Algerian homes. Elements of Mission Revival Style architecture can also be found in its design.